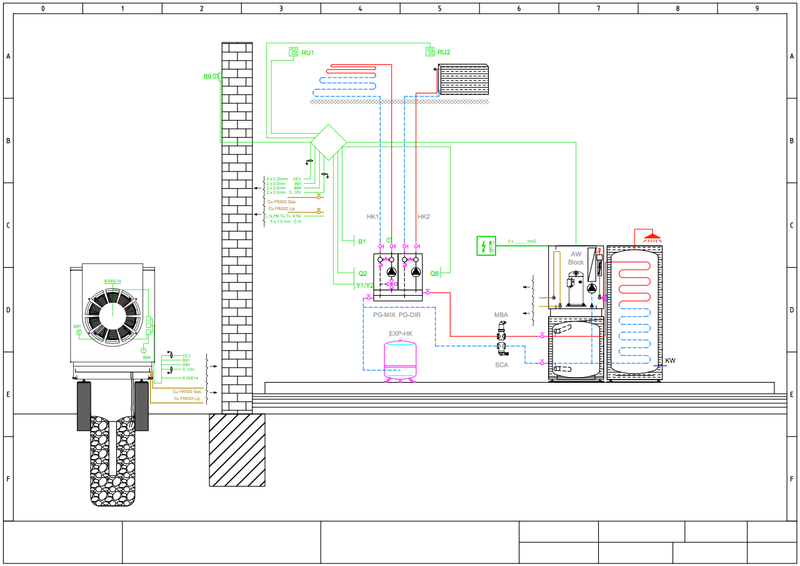 Small size split air - water split heat pump with scroll compressor in internal unit and external unit. Available in combination with DHW boiler tank or buffer tank of 80 liter. With stable frame construction and flexible outputs. Double high-absorption suspension with sylomer pads and adjustable base plates ensure low noise and vibration levels of the Scroll compressor. Stainless steel plate heat exchanger (1,4401) for heating circuit. Free-hanging Al-Cu V-shaped heat exchanger with water resistant coating in the outdoor unit. Electrical switchboard with integrated safety elements and equithermal controller of the heat pump is located below the upper lid in the indoor unit. Quiet, low-speed EC Ziehl - Abegg with bionic fins. Reversible defrosting optimized via APS system with subcooling of liquid refrigerant. With electronic starter via built-in soft starter and electronic expansion control with autoadaptivity. Frame construction with a massive base plate on adjustable legs. Covering the epoxy-coated unit. The multi-layer sound insulation and vibration-eliminating profiles are glued from the inside of the cover. Equithermal, digital control of the heat pump with integrated cooling control function. For controlling one heating or cooling circuit with mixing unit, for one heating or cooling circuit without a mixing unit. Temperature regulation for DHW storage tank and control of electrical backup heating elementnt inside the heat pump. Simple extension of control up to 3 heating / cooling circuits via expansion modules or up to 16 circuits via system controllers. The standard version also includes solar control as well as the possibility of cascading up to 16 devices. Possibility to integrate with 200 liter DHW tank and 80 liter buffer tank. Optionally available with ModBus module as well WebControl control and monitoring via the Internet. Connection port size [ " ] 1" 1" 1"